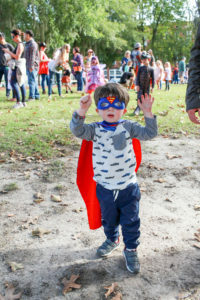 Home > Blog > Events > Our Largest Fall Festival! We had a great turnout this year for our annual Fall Festival at the Waters! We had over 200 kids in attendance, plus parents! 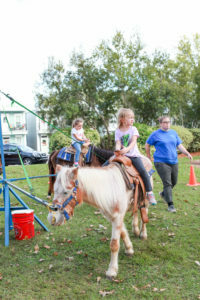 This year was our most attended Fall Festival to date. We had a lot of fun this week hanging out with our Waters community and our friends at the Montgomery Zoo. Read below about some of the highlights of our 2018 Fall Festival. No fall festival would be complete without games! 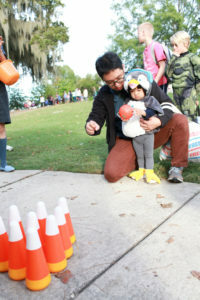 This year, we had a pumpkin toss, fishing booth, football toss, mini-bowl, face painting and much more! Each station was stocked with candy and prizes, so our kids went home with plenty of sweets! The Montgomery Zoo also brought some of their furry friends, including Sheldon the Armadillo, Luna the Hedgehog and Rusty the Owl! Kids had a blast interacting with them and learning more about their unique characteristics. In addition to our games, we also had a hay bale slide, corn and ball pit, and pony rides! And, of course, there were costumes! The Waters prides itself on its close-knit community of residents and businesses. This year, we had help from a few local businesses on making our Fall Festival truly special. Jackson Landscape donated and delivered hay bales for our slide, Landscape Workshop provided pumpkins for decor, Century Church assisted with our “Go Fishing” booth and Saint James Church sponsored the football toss and face painting booths. Our sponsors stepped up and provided our community with a great Fall Festival and we couldn’t be more thankful for the help we received! Even though we were rained out for our original date of October 20th, hosting the Fall Festival during the week gave our community a reason to get out and get festive! The Festival started right after school let out, and our neighbors biked and took their golf carts over to the Town Square. The school bus even dropped off the bigger kids to the square. It was a perfect way for kids to enjoy some after school fun while being safe and looked after! 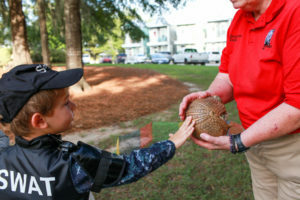 At the Waters, we’re always thinking of fun events for our community. Not only do we have a wide range of amenities for our residents, but we’re also passionate about giving our community safe, family-friendly and fun activities throughout the month. The Waters is the front porch-friendly, vibrant neighborhood where sidewalks and front porches frame the streets and the entire neighborhood is your home. We strive to create a traditional, close-knit neighborhood that’s brimming with things to do. We work with our community of local businesses and partners to constantly create new, exciting events for our neighbors and the surrounding community. We’re excited for next year’s Fall Festival and the events yet to come! As always, take a look at our events page. We’re always updating it with activities that may be a perfect fit for you and your family. Why settle for anything less? Your family deserves the best. Call 334-272-3200 today.